This would definitely be my go-to mobile wood fire pizza oven whenever I am camping or entertaining guests in my back yard. Maximum woof fire oven is designed and assembled in Portugal. It takes the shortest time to heat up and lightweight making it extremely portable. Maximus wood fire pizza oven measures 23.5 by 23.5inches on the inside wheel the outer surface measures 27.5 by 27.5 inches. The inner wall is lined with stainless steel while the outer wall is high-grade aluminum. In between the two walls is a ceramic insulation blanket. This wood fire pizza oven only takes 30 minutes to heat up and can retain heat for an hour. I have always been able to make close to 30 12-inch pizzas under an hour with this oven. When purchasing the product, it includes a chimney, pizza peel, bent wire for lighting, and a metal divider to keep the wood away from the food. What I like about this wood fire oven is how light it is. It weighs a mere 150 pounds and only needs two people to carry it around. It is also compact enough to fit into the trunk of a small car. Fuel consumption is relatively low as the oven only consumes 8 pounds of wood an hour. If you need a pizza oven that is made of quality materials as Maximus mobile wood fire oven, then the ilFornino professional wood fire oven would be an ideal choice. The two wood fire pizza ovens have similar features and functionalities. They are both durable, retain heat for significant periods and are easy to use. This may be a pro level wood fire oven, but I still love how basic it is to use. Both the inside and outside of this wood fire oven is constructed from heavy-duty 430 grade stainless steel. In between, are three layers of ceramic insulation blankets for better heat retention. The oven’s floor is layered with medium density bricks. The bricks measure one inch each and are capable of heating up to 900°F. In terms of weight, the ilFornino wood fire pizza oven is a little heavy weighing 270 pounds. Luckily, the steel stand underneath includes wheels that enhance mobility. Another upgrade worth mentioning is the ability to vary the height of the oven. Heat insulation is commendable; 5 times more than a brick wood fire oven because of the three-layer insulation. I would pick the ilFornino wood fire pizza as a second choice anytime. It is built like a tank and has longer heat retention ability. I could hold many backyard pizza parties with this oven as it cooks up food faster. I would give it first place if only it was more portable. I would definitely recommend the Uuni 3 wood fire pizza oven to anyone looking for quality ovens on a budget. This pizza oven costs only $299, which is relatively cheaper than the other wood fire pizza ovens in this review. It also heats up faster and has lower fuel consumption compared to most wood pizza ovens I have seen. This Uuni 3 wood pizza oven is also an upgrade from its predecessor. Notable upgrades include the revamped inner insulation, which has better heat retention. The chimney is detachable for easy cleaning and transportation. The new Uuni 3 model now stands on three legs, from the previous four, making it more stable to use. In terms of heating up, this wood fire oven only takes 10 minutes to reach maximum heat. By maximum heat, I mean a total of 932°F. This is enough heat to cook a large pizza in less than 60 seconds. What’s more, Uuni 3 wood fire pizza oven uses wooden pellets for fuel instead of chunks of woods. This wood pizza oven would have easily taken first place for me. It heats up fast, cooks up food in seconds, and has low fuel consumption. Unfortunately, it is a bit bulky to carry around. If you need to you need a wood fire pizza oven, consider buying the Uuni 2S fire pizza oven. Ths is a high quality product with a high price. It is an upgrade for the other wood fire pizza ovens in this review because it is a multi-purpose pizza oven; it not only bakes tasty smoke flavored pizzas, but it can also be used to roast meat, fish, and vegetables. In addition, it generates enough heat to cook a sizable pizza in under a minute. The Uuni 2S pizza oven is made from brushed stainless steel, which is durable, and a good conductor of heat. The oven is fired by wooden pellets which are cheaper and more energy saving. When hot enough, this pizza oven achieves temperatures of 932°F, which is ideal for speeding up the cooking process. When buying the Uuni 2S wood fire pizza oven, you also get a pizza peel and stone baking board as accessories. This complete setup makes it easy to bake smoky and tasty pizzas in minutes whether you are holding a barbecue party or just having dinner with family. This is one of the most portable of pizza ovens on the market. What makes it stand out from the rest is that it uses disposable propane tanks for fuel as opposed to wood. 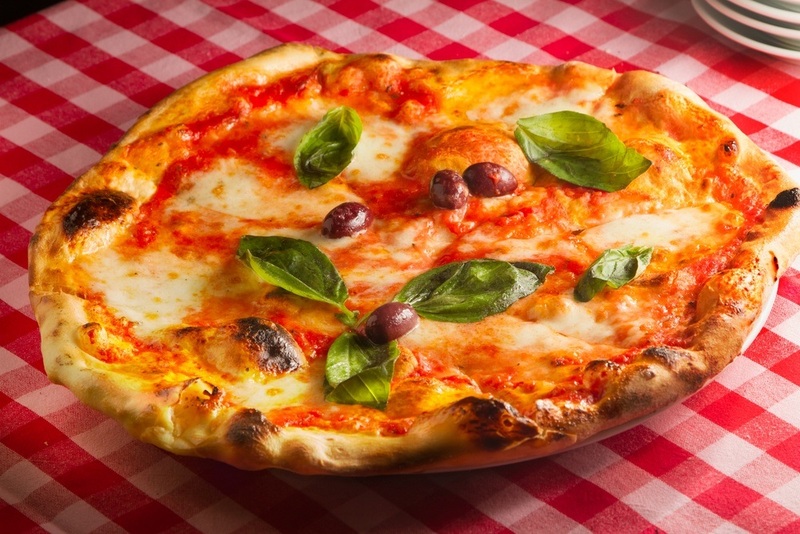 You may not get that authentic woody flavor on your pizza, but you can still get a well-cooked pizza while camping in the woods. The Camp Chef Italia pizza oven is tiny in the sense that it would fit in a sizable bag. For fuel, it uses either 1-pound disposable propane tanks or a 20-pound tank with a 5 feet hose to connect. The entire oven is constructed with high-grade stainless steel and fitted with double layer ceramic ceiling for heat retention. 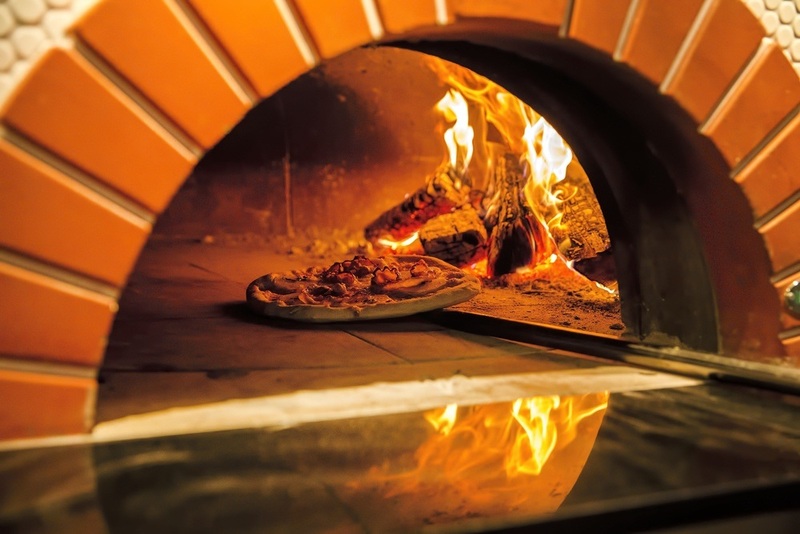 Despite the tiny body, chef Italia pizza oven can produce heat of up to 700°F. This is enough heat to cook any pizza less than 12 inches in less than 15 minutes. The pizza oven has an ignition valve control that lets you control how hot your oven will be. In addition, there is a built in thermometer to gauge internal temperatures and know when to start throwing your pizza in. ​Preheats in minutes and can reach temperatures of 700°F. What do you do when you do not have a fully made wood fire pizza oven? Easy, just convert your normal kettle grill into a cooking chamber with the KettlePizza oven kit. This oven kit is designed to fit kettle grills with diameters 18.5 inches and 22.5 inches. If you ask me, this is the cheapest way to cook an authentic wood flavored pizza. The kettlePizza oven kit fits between the top and bottom part of your grill without the need for assembly tools. Once fitted, the kettle grill only has a single outlet where the heat escapes. This directional heat is what you use to cook the pizza evenly top and bottom. For best results, I always use hardwood for fuel to achieve that smoky flavor on all my pizzas. Does this setup work? The answer is simply yes. I was amazed that this kit could generate temperatures of up to 900°F. I used a mixture of hardwood and charcoal to create a constant heat source so the pizza cooks evenly. 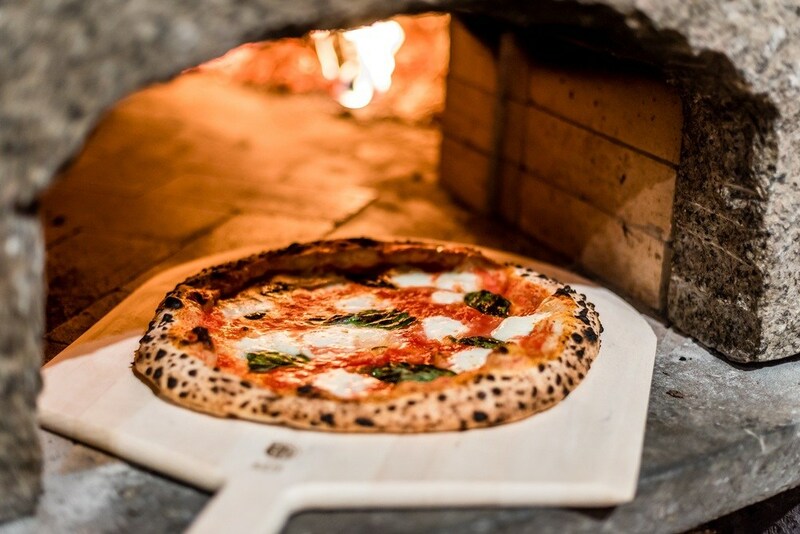 The best part, this makeshift wood fire oven can cook up to 14-inch size pizzas. My KettlePizza oven kit included a pizza pan but I had to buy the pizza sleeve separately. KettlePizza also sells a deluxe pack that includes a handmade pizza stone made from either wood or aluminum. The Pizzarette countertop pizza oven is a product from Table Top Chefs. This mini oven sits right on top of your kitchen or dining table allowing everyone to cook their own pizza in minutes. 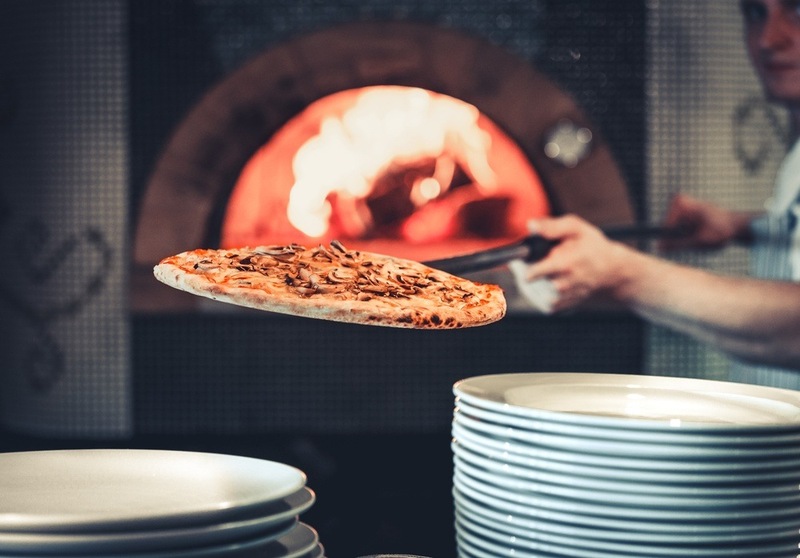 It may be nicknamed the world’s funniest pizza oven; however, it is designed to commercial quality and produces remarkable results similar to a normal stone oven. Pizzarette mini pizza oven features a stone surface and a terracotta dome covering the entire oven. It heats up using electricity making it ideal for indoor use. When powered up, it takes less than 5 minutes for heat to be evenly distributed on the stone surface and the terracotta dome. Once the oven is hot enough, it only takes 5 to 10 minutes to evenly cook the mini pizzas. The stone surface is detachable making it easy to clean up after a single cooking. Personally, I like to use parchment paper between the dough and stone to reduce cleaning time. Another tip is to roll the pizza small and thin for them to cook within the recommended time. I randomly bought this Pizzarette countertop pizza oven and immediately fell in love with it. It made meal times with family quite enjoyable and of course gave the kids some early cooking skills. I also made sure there is plenty of dough to go around since one serving is never enough. This basic oven turns any stovetop into a commercial pizzeria. 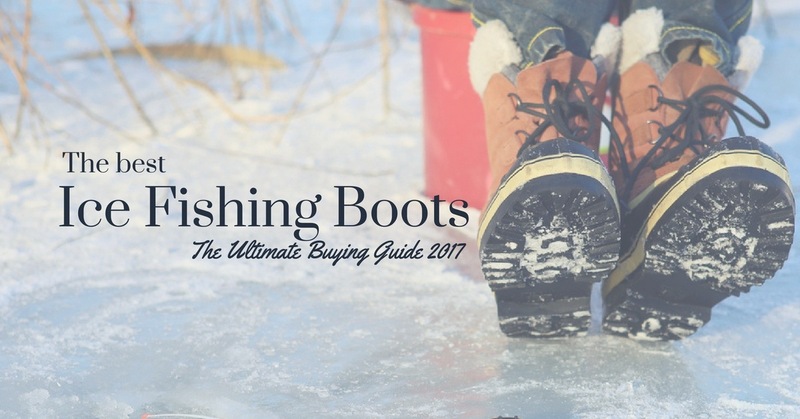 It only requires one of your stove burners to work and will achieve temperatures that would rival a normal stove oven. Heating up the oven takes a short time and cooking your pizza even shorter. Pizzacraft PC0601 stovetop pizza oven features a dual cordierite baking stone. This stone draws heat from your gas burner and evenly distributes it throughout the cooking chamber. The cooking stones are also separated by a vacuum for further diffusion of heat. On the outside, the Pizzacraft pizzeria oven features heat traps for minimal heat loss and to achieve the desired temperature to evenly cook your pizza. The mini stovetop pizza oven can achieve temperatures of up to 600F, which is higher than most stove ovens. When evenly heated, this Pizzacraft pizzeria stove oven will cook your pizza in less than 15 minutes. This alternative oven from Pizzacraft is ideal for anyone who does not wish to endure a smoky kitchen. It fits a backyard barbecue party where you want to make quick crusty pizzas. The Pizzacraft PC6500 pizza oven is gas powered to avoid those smoky episodes common with wood ovens. Pizzacraft PizzaQue outdoor pizza oven comes readily assembled. You only have to plug a 20lb propane gas to last you 25 hours of cooking. This roughly translates to 250 large pizzas. To work better, this outdoor oven will require a couple of accessories. A folding peel and stone brush makes it easy to remove the ready pizza from the oven without making a mess. A leg kit is purchased separately too which can elevate the oven to 3.3 inches from the ground. This makes it easy to access the oven when cooking. You can also purchase a side table where you will be prepping the dough before tossing it into the cooking chamber. For that smoky flavor, add a wood pellet smoker, which is also bought separately. 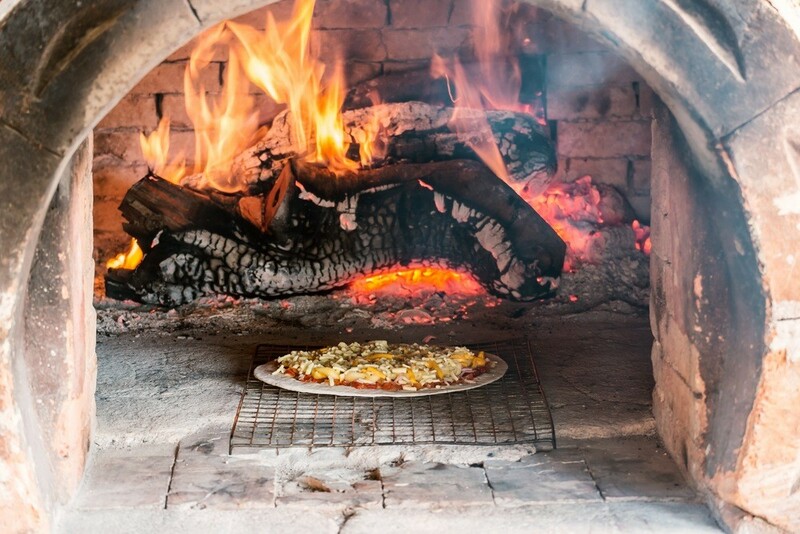 Traditional wood fire pizza ovens are built from bricks, adobe, stone, or clay. They are large and stationary and often quite expensive to install. Most people prefer constructing their own wood fire ovens. However, the materials can also be costly. The next available option is to buy a mobile wood fire pizza oven. 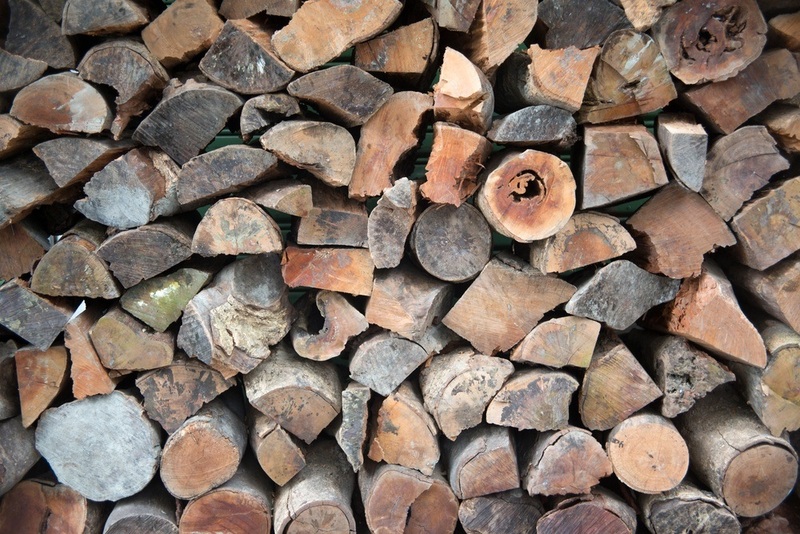 There are a couple of things to consider when buying wood ovens. How big or small the mobile wood pizza oven is will depend on your budget and the space you intend to use for the oven. The number of people you will be making pizzas for will also determine the size of your wood fire oven. 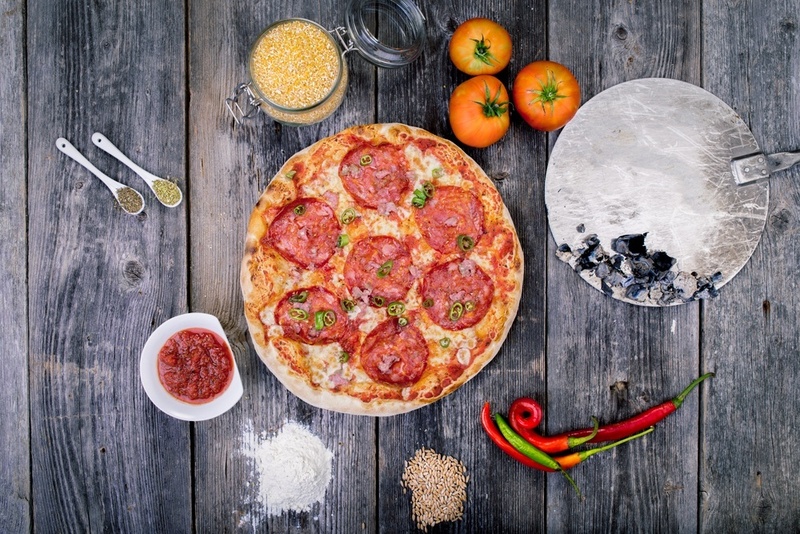 Generally, large ovens have enough space to cook more than one pizza. In addition, bigger ovens have greater heat retention and make it easy to transition from one cooking to another. In addition, if you are feeding a large number of people, a bigger oven will be more convenient. Large mobile wood pizza ovens have their shortcomings. One, they can take from one to two hours to fully heat up. Secondly, they consumer a lot of wood fuel per cooking. The cost of installing large wood fire ovens is also high. In addition, their large size limits mobility. 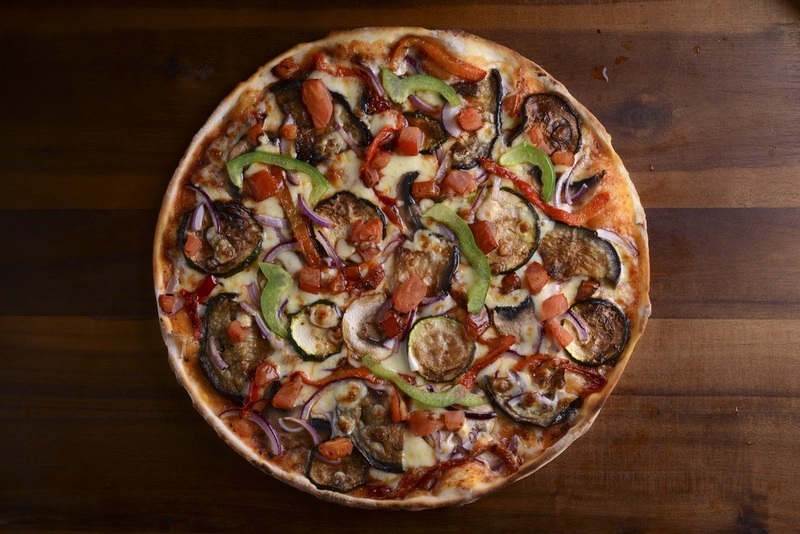 Smaller wood pizza ovens are an ideal alternative to their larger counterparts. They take less time to heat up and are very portable. The downside to smaller ovens is they can only cook smaller portions of food at a time. Though they are quick in heat generation, compact wood fire ovens also lose heat faster. Traditional wood fire ovens are constructed from bricks, stone, or clay. This makes them heavy and less mobile. An alternative to this is the steel wood pizza ovens, which offer the same value for money. Steel pizza ovens still use wood as fuel so the taste and texture of food is not ruined. Their steel construction also makes them durable and lighter to carry around. A steel wood fire pizza oven is an ideal option if you are looking for a budget oven. In addition, steel pizza ovens are perfect if you intend to use it in a rented house or are planning to sell your house in future. In both cases, you want to take the oven with you and this may not be possible for a brick wood pizza oven. The shape of the oven affects mostly the cook time. Mobile wood fire pizza ovens can be constructed with a dome or barrel shape. The dome shaped ovens were the first to be constructed and are considered to have better heat distribution. The barrel shaped wood fire pizza ovens are wider providing more space for cooking. However, they often do not distribute heat as evenly as the dome shaped ovens. Choosing between a dome or barrel shape depends on personal preference and what you are willing to sacrifice; space or quality. I would personally vouch for each of the pizza ovens I just reviewed. However, my favorite pizza opens remains the Maximus mobile wood-fired pizza. I find it compact and lightweight enough to take to any camping party or the neighbors when they invite me over for a barbecue. The oven is built with high-grade stainless steel and aluminum and adds an insulating layer for better heat retention. I can cook 30 large pizzas in just one hour and still have enough residual heat to dry up some extra wood pieces for my next cooking. The all red color is also a win for me as it makes the oven look chic and fit for the outdoors.